‘Chuck,’ ‘Descendants 2,’ ‘Once Upon a Time in Venice,’ More on Home Entertainment … plus a giveaway!!! An underdog story inspired by the life of heavyweight boxer Chuck Wepner, “Chuck” arrives on Blu-ray, DVD and Digital HD Tuesday Aug. 15 from Paramount Home Media Distribution. The biopic also will be available from cable, satellite and telco providers through IFC Films. 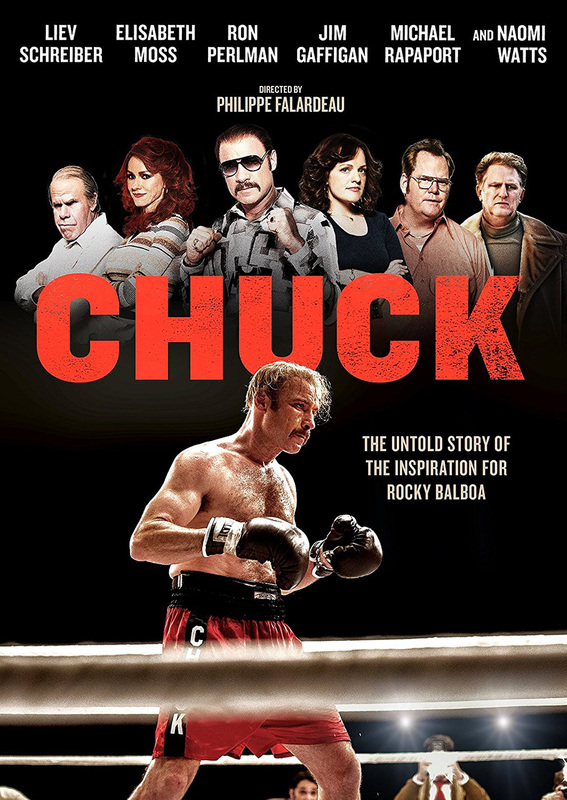 Liev Schreiber stars as Wepner, the boxer who went 15 rounds in the ring with world heavyweight champ Muhammad Ali and became the real-life inspiration for Rocky Balboa. Before that, Chuck was a liquor salesman and father with a modest prizefighting career whose life changed overnight when, in 1975, he was chosen to take on “The Greatest” in a highly publicized title match. It’s the beginning of a wild ride through the highs and lows of sudden fame and what happens when someone’s 15 minutes in the spotlight are up. The kid-friendly “Descendants 2” is available on DVD Tuesday, Aug. 15. In this highly anticipated sequel to the Disney Channel’s original 2015 feature, the villain kids are back and the stakes are even higher. The teenage sons and daughters of Disney’s most infamous villains—Mal, Evie, Carlos and Jay (also known as Villain Kids or VKs)—try to find their place in idyllic Auradon. When the pressure to be royally perfect becomes too much for Mal, she returns to her rotten roots on the Isle of the Lost where her archenemy Uma, the daughter of undersea baddie Ursula, has taken her spot as the self-proclaimed queen of the run-down town. Resentful over not being selected by Ben to go to Auradon Prep with the other Villain Kids, Uma stirs her pirate gang including Captain Hook’s son Harry and Gaston’s son Gil, to break the barrier between the Isle of the Lost and Auradon, and unleash all the villains imprisoned on the Isle, once and for all. Kenny Ortega (“High School Musical” franchise) directs music-filled live-action fantasy from a screenplay by Sara Parriott and Josann McGibbon. 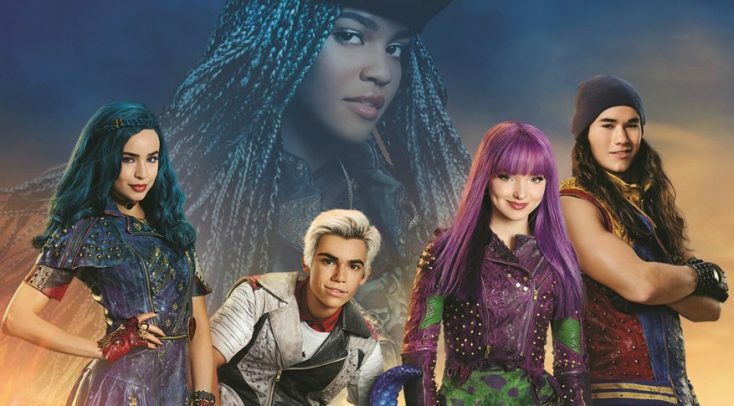 Disney mainstay Dove Cameron (“Liv and Maddie”) stars alongside Cameron Boyce (“Jessie”), Sofia Carson (“Adventures in Babysitting”), Booboo Stewart (“X-Men Days of Future Past”) and Mitchell Hope, reprising the roles of Mal, Carlos, Evie, Jay and King Ben, respectively. Starring as the new villains are China Anne McClain (“A.N.T. Farm”) as Uma, the daughter of Ursula; Thomas Doherty (“The Lodge”) as Harry, son of Captain Hook; Dylan Playfair (“Some Assembly Required”) as Gil, son of Gaston; and Anna Cathcart (“Odd Squad”) as Dizzy, daughter of Cinderella’s evil stepsister Drizella and granddaughter of wicked stepmother Lady Tremaine. Reprising their roles in the sequel are Brenna D’Amico as Jane, the daughter of Fairy Godmother; Melanie Paxson as Fairy Godmother; Dianne Doan as Lonnie, the daughter of Mulan; Jedidiah Goodacre as Chad, the son of Cinderella; Zachary Gibson as Doug, the son of Dopey; Keegan Connor Tracy as Belle and Dan Payne as Beast. Bruce Willis stars in “Once Upon a Time in Venice,” which will be available Tuesday Aug. 15 on DVD and in a DVD/Blu-ray combo pack. Directed by Mark Cullen (“Cop Out”) who co-wrote the film with Robb Cullen (“Back in the Game”), the action comedy also stars John Goodman (“The Big Lebowski”), Jason Momoa (“Game of Thrones”), Famke Janssen (“X-Men” franchise) and Thomas Middleditch (“Silicon Valley”). The film will be available on DVD for a suggested retail price (SRP) of $29.96 and on DVD/Blu-ray combo for an SRP of $34.97. Metropol Pictures is set to release “Union Furnace” on Blu-ray and DVD Tuesday Aug. 15. Director Nicholas Bushman (“Stranger in the Dunes”) co-wrote the horror-thriller with Mike Dwyer (“Sandbar”). Dwyer also stars in “Union Furnace” along with Keith David (“Platoon”), Katie Keene (“ClownTown”) and newcomer Seth Hammond. Metropol Pictures will release “Union Furnace” on Blu-ray for an SRP of $19.99 and on DVD for an SRP of $11.99. Small-town crook Cody (Dwyer) was at the end of his rope when a mysterious stranger offered him the chance of a lifetime. There was just one catch—in this game he would have to wager everything, including his life. Cody finds himself trapped with a band of outsiders and misfits, all fighting for their lives and a slice of the American dream. Fueled by a horde of masked sadists, he and the others vie to win a fortune … or die a brutal death. The Blu-ray and DVD include a bonus making-of featurette, which goes behind the scenes of the production and features interviews with the cast and crew. One of Acorn’s most popular series, “Murdoch Mysteries” debuts Season 10 on DVD and Blu-ray on Tuesday Aug. 15, from Acorn TV, an RLJ Entertainment company. Set in Toronto in the late 1890s and early 1900s during the Age of Invention, the popular mystery series centers on Det. William Murdoch (Yannick Bisson), a methodical and dashing detective, who enlists radical new forensic techniques like fingerprinting, ultraviolet light and trace evidence to solve some of the city’s most gruesome murders. Dr. Julia Ogden (Helene Joy) deals with post-traumatic stress from her near-death experience; Constable Crabtree (Jonny Harris) faces relationship problems; Inspector Brackenreid (Thomas Craig) gets caught up with a passion for soccer; and morgue attendant Rebecca James (Mouna Traore) determinedly pursues her medical education. As Murdoch and his team face murdered debutantes and cutthroat athletes amid historical events like the Great Toronto Fire of 1904, old enemies come back to haunt them. Along the way, they encounter some of the greatest minds of the time, including horror author H.P. Lovecraft and inventor Reginald Fessenden. Guest stars in Season 10 include Samantha Bond (“Downton Abbey”), Ari Millen (Orphan Black), Peter Keleghan (The Red Green Show), and singer Alan Doyle. Join your Mickey, Minnie, Donald, Daisy and Goofy and their high-speed transforming Roadsters as they compete in thrilling races stretching from Hot Dog Hills to Hawaii to London, in “Mickey and the Roadster Racers: Start Your Engines.” The DVD set, from Disney Junior, is available Tuesday Aug. 15 and contains six fun-filled episodes along with two bonus episodes. Meet the world’s greatest spy, zoom through the skies in a revved up hot-air balloon race, and even return the Queen’s stolen Royal Ruby. “Mickey and The Roadster Racers: Start Your Engines” is all about the value of friendship, teamwork, a little competition and humorous high-spirited adventures. The voice cast includes Bret Iwan as Mickey Mouse; Russi Taylor as Minnie Mouse; Bill Farmer as Goofy/Pluto; Daniel Ross as Donald Duck; and Tress MacNeille as Daisy Duck. Rob LaDuca serves as executive producer and Mark Seidenberg is the co-executive producer and supervising story editor. One of Townsville’s most magical citizens, Donny the Unicorn is the star of Cartoon Network’s upcoming DVD release of “The Powerpuff Girls: The Last Donnycorn,” available Tuesday Aug. 15. Join pint-size superhero sisters Blossom, Bubbles and Buttercup in 12 episodes from the Emmy-nominated hit series’ first and second season. The trio take on all types of troublemakers, from ferocious fortune-tellers to yucky yetis and of course mixed-up monkeys named Mojo Jojo. Luckily for the city of Townsville, the three sisters always manage to tap into the power of teamwork to topple evildoers. The DVD includes the half-hour special, “The Last Donnycorn,” in which Donny comes to the girls for protection when he’s hunted by a robotic unicorn. After narrowly escaping, he reveals that he’s accidently unleashed evil unicorns that were trapped inside of a magic mirror upon Unicorn Land and needs the girls’ help to save his dimension. Juggling school, homework and a regular parade of villains is no easy task, but the Powerpuff Girls are more than up to the challenge. It also includes the Emmy-nominated episode “Once Upon a Townsville,” and bonus content, including five “The Powerpuff Girls” mini episodes. “The Powerpuff Girls: The Last Donnycorn” will be available for $14.97 SRP. The Emmy nominated “The Powerpuff Girls” is produced by Cartoon Network Studios, with Nick Jennings (“Adventure Time”) serving as executive producer and Bob Boyle (“Wow! Wow! Wubbzy!”) as co-executive producer. The series features the voices of Amanda Leighton as Blossom, Natalie Palamides as Buttercup and Kristen Li as Bubbles. Monster battles and classic adventures of Digimon have captured a special place in the hearts of millions of fans and continues to stand as an enduring global pop culture phenomenon since it premiered in the 1990s. On Tuesday Aug. 15, Shout! Factory, in collaboration with Toei Animation, presents the new anime feature “Digimon Adventure Tri. —Determination” on DVD. Produced by Toei Animation, the animated adventure appears for the first time on DVD in North America. The movie is presented with an English voice cast as well as the original Japanese audio with English subtitles, including Joshua Seth, who voiced the main character, Tai Kimiya, in the original series returns to the role for this feature film, alongside the team of voice talent and Digimon luminaries. Time has passed since Alphamon appeared and restoration has begun in Odaiba. When another infected Digimon—an Ogremon—appears and begins to wreak havoc on Odaiba, Mimi and Palmon spring into action. But in their haste to show the world that there are good Digimon, their battle brings about unforeseen consequences. The original Japanese language track and a look behind the scenes at directing the film’s voice cast are bonuses on the disc. Front Row Features is giving away something for every kid in the family this week. For youngsters, we’re giving away a copy of Disney Junior’s “Mickey and the Roadster Racers: Start Your Engines” on DVD and for tweens and teens, we’re giving away a copy of the Disney Channel original movie “Descendants 2” on DVD. For your chance to be the coolest mom or dad on the block, simply email SoCalMovieEditor@aol.com by Aug. 21 with the title of the DVD you want to win in the subject line to enter that title’s respective contest. Good luck! Next PostPhotos: ‘Chuck,’ ‘Descendants 2,’ ‘Once Upon a Time in Venice,’ More on Home Entertainment … plus a giveaway!! !